Periodontal disease, injury, decay or other health complications can cause people to lose their teeth overtime. Dentures can be placed to improve a patient’s smile and help against fatigue muscle sag. When patients lose their natural teeth, there comes a time when they will need to look into a partial denture or full denture. A full denture replaces all the missing teeth in the upper or lower arch usually after the teeth have been extracted. An immediate denture allows for the patient to have more of a “temporary denture” so the patient never has to go without teeth. Overtime, after extracting the teeth, the bones and gums begin to shrink during the healing process. After the gums heal, the dentist will then make the patient a new “more permanent” full denture. Dentures are fabricated by a dental lab and the dentist will take impressions, records, measurements, and have the patient do a few wax try-ins to make sure the final denture will fit properly once made. 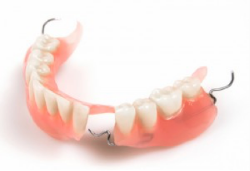 Dentures usually require adjustments after they are made to ensure proper fit and comfort. Dentures don’t last forever. Overtime, dentures will need to be replaced due to natural changes with age, changes in health, or weight loss. When the gums shrink or a denture begins to wear overtime, the dentist can usually reline, rebase, or make a new denture. If you are a candidate for dental implants, they are a great way to secure a denture. A regular denture is not supported by implants and rests on the gums. An implant-supported denture is used when a person doesn’t have any teeth in the jaw, but has enough bone in the jaw to support implants. An implant-supported denture has special attachments that snap onto the implants. Implants are generally used on the lower jaw due to less stability with lower dentures. However, you can receive an implant-supported denture in either the upper or lower jaw. Partial dentures are suitable when a patient only has a few missing teeth. Partial dentures usually consist of replacement teeth attached to a pink plastic base, which is connected by a metal framework that holds the denture in place in the mouth. A partial denture prevents other teeth from shifting and allows the patient to have support when chewing or talking. Partials are fabricated similar to dentures and usually require a few adjustments after the partial is seated. There are a few different types of partials and we can help you decided which is best for you. Like natural teeth, dentures too need to be brushed daily to remove food deposits, stain, and plaque. A denture can be cleaned with a mild detergent but avoid cleaning with household cleaners that may be too abrasive. When the dentures are not being worn, we suggest soaking them in a denture cleanser or in room temperature water to avoid them from completely drying out. Not only should you brush your denture, you should brush your gums, tongue, and palate to help keep your gums nice and healthy. 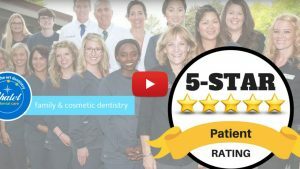 Don’t forget to visit us regularly even if you do have dentures so we can check your dentures and also examine your mouth for signs of oral diseases, including oral cancer.